Justin Mullins collects beautiful equations. 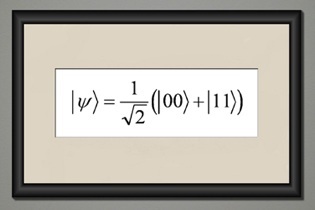 Well, some people think equations are beautiful. I don't know. But the description of this one is. It is about entanglement. The connections between ordinary objects are fleeting and superficial. Two atoms may collide and separate, never to meet again. Others can stick together by virtue of the chemical bonds they form, until the day that bond is broken. But there is another type of connection that is far more powerful and romantic. Certain objects can become linked by a mysterious process called entanglement. Particles that become entangled are deeply connected regardless of the distance between them. If they become separated by the width of the Universe, the bond between them remains intact. These particles are so deeply linked that it’s as if they somehow share the same existence. Physicists do not yet fully understand the nature of entanglement but there is growing evidence that it is a fundamental property of the universe. Unfettered by the restrictions of space, entanglement may be the ghostly bedrock upon which reality is built. May this explains that interesting phenomenon of two unconnected people in different parts of the world inventing the same thing at the same time - which is such a gift to patent lawyers! It may also underpin ESP effects and other coincidences. Presumably this is also interlinked with the six dimensions of super strings? ...but leave it to Uncyclopedia to come up with the punk version. preciate the uncyclopedia link, jstarrs. this entanglement thing also explains the mysterious coming together of ideas across the globe to form microscopic communities. Without the net, we'd only have been able to intuit our communication - without 4D proof, so to speak. Aaaaah, now I get it Jeff, its all about AAAAAAAA. That's, like, seriously entagled. Well you've got me entangled!